Read this article to learn current pricing dynamics in the Madrid property market and understand why it is still the best European city for property investment, even after the sharp price increase of 2017. We also reveal some exciting news for Airbnb property investors towards the end of the article. Is Madrid property still relatively cheap? The Madrid property market has experienced massive structural change. These include an improving housing stock, the Government decreasing real estate taxes and increasing infrastructure investment. Factors such as Brexit and people fleeing the Trump Administration have driven new investors to the city. In fact, according to Deloitte, 20% of all Spanish real estate transactions made in 2017 were by foreigners. These were almost all on the Mediterranean Coast, the islands or in Madrid. Madrid is benefitting from the fallout of the Catalan Independence Movement. Once a prime spot for Spanish real estate investment, increased instablity and xenophobia in the region are causing investment to shift to the capital. How does the Madrid property market compare with those in other European capitals? This is because the Madrid property market has traditionally lagged behind others in Europe. In the past, the Madrid property stock was of very low quality. The recent run-up in prices partially reflects the fact that investors have purchased properties, renovated them and then sold them at higher prices. There is still a long way to go before the apartment stock in Madrid is of equal quality with Paris or London, and prices start to align more closely with other European capital cities. There has been a lot of very negative talk in the Spanish press about rents in the center of Madrid being too high. Many claim that rents have become too expensive for locals to afford. Politicians and less savvy locals blame Airbnb investment for pricing locals out of the market and forcing them to rent apartments in the suburbs. However, much of this is overly dramatic and politically motivated. The data shows a different story. Rental rates slowed dramatically in 2017, only increasing 3%. Interestingly, the veracity of the Airbnb theory is coming under scrutiny. Recently, it was revealed that Spain’s National Commission on Markets and Competition (CNMC) has done their own research, and not found evidence anywhere in Spain of an increased Airbnb stock driving up rental prices. The CNMC is challenging the actions of the municipal goverments of Madrid, Bilbao and San Sebastian to limit the activity of homesharing websites such as Airbnb. Taking it one step further, they even defended Airbnb’s platform and business model. Real estate experts know that price to rent ratios are one of the most important indicators of the health of a real estate market. Rents increasing at slower rates than property prices means that Madrid’s price to rent ratio has increased. Price to rent ratios are considered bellweathers of the strength of a propery market. The lower the price to rent ratio, the better. Although this might seem bad news for the Madrid property market, when one compares Madrid’s price to rent ratio to that of other major European capitals, it is still one of the absolute lowest. This is because rents in Madrid have typically been high. This is due to the limited housing stock, and the fact that most Spaniards can’t afford a down payment on a house. But what about new construction? One of the major causes of the pre-crisis runup in prices, and lengthy recovery period after the crash, was the construction boom. We reported in our 1Q18 Madrid Real Estate Report that consensus was forming that the industry is acting with much greater restraint, post crisis. New data from Deloitte backs this up. Almost all of this was on the Mediterranean coast, the Balearic Islands and the Canary Islands. The 2017 new construction number is still 91.9% less than peak construction in 2007. In conclusion, the Madrid property market has seen higher property prices in recent quarters. Rents have also increased, but at a slower rate. This has slightly compressed price to rent ratios. Madrid-centric newspapers and investors have started to sound the alarm, but that is a very insular view. When compared to other European capitals, the Madrid property market still has one of the lowest price to rent ratios of all cities, making it one of the healthiest property markets on the continent. 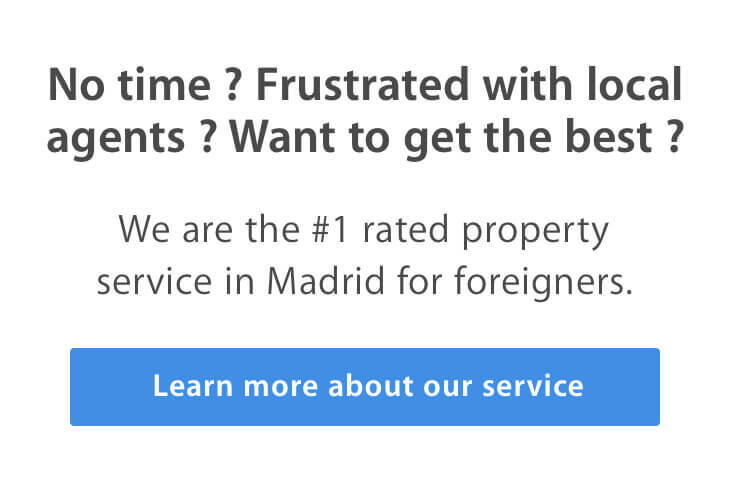 If you want to take advantage of this, arrange a FREE CONSULTATION today to learn how easy we make it for non-Spaniards to invest in Madrid real estate.